This variant adopts live polar-cells, but uses pieces from XiangQi. There are two sides designated gold and red. Gold moves first. 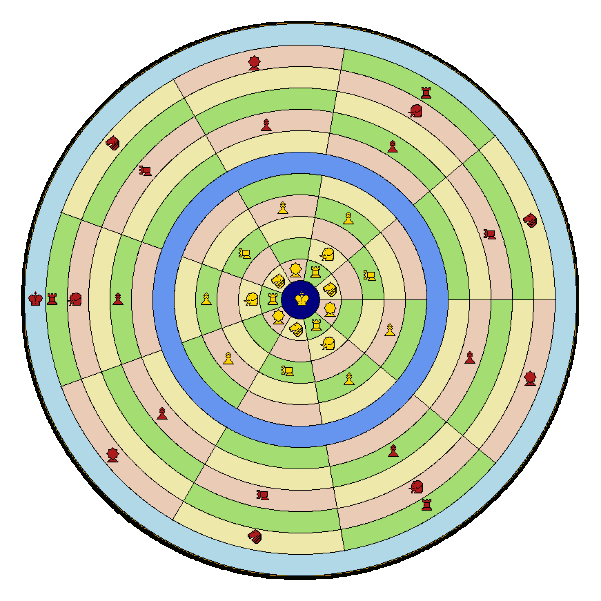 Piece positions are based on cells rather than points and the board is a sphere constructed from 92 cells. The starting position is shown in Image 1. The light-blue outermost circle is a single cell, the red's pole. 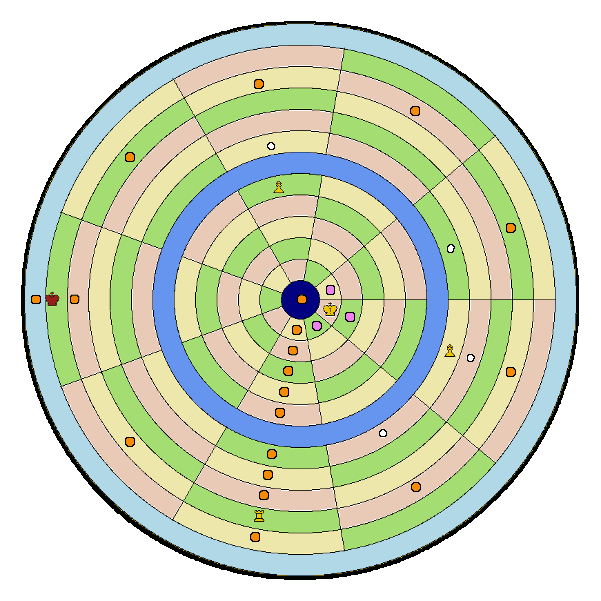 It is connected both orthogonally and diagonally to all the 9 cells in the next inward circle. 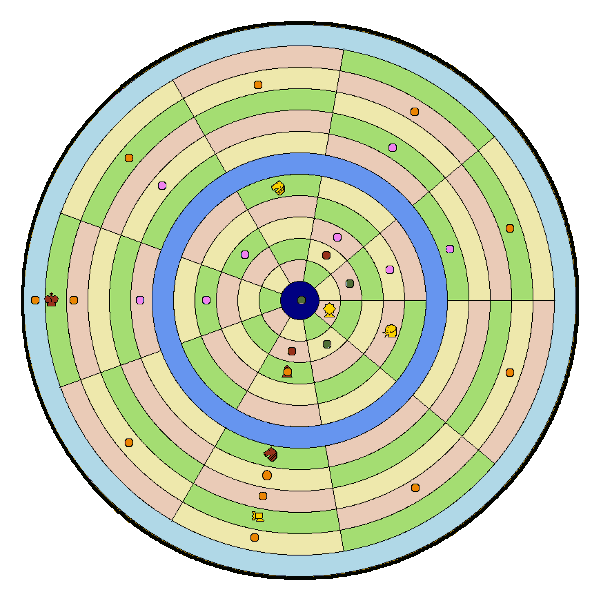 Likewise the dark-blue central circle, the gold's pole, is connected both orthogonally and diagonally to all the 9 cells in the next outward circle. The blue circle on the sphere's equator is the river separating Gold's home hemisphere from yhat of Red's. The palace or fortress for each side includes that side's pole plus the cells of the next two circles. The poles may also be referred to as 'thrones'. The piece graphics are scaled down from the Alfaerie pieces by David Howe. The moves are as for orthodox 'flat' XiangQi and are illustrated in Images 2 and 3. Working from the centre outwards, the Gold King's possible mpves are shown by violet dots. Note that this King is prevented from moving to the pole cell by the 'facing Kings' rule. Next the Gold Pawns' moves are shown using white dots, and finally the Rook's moves are shown with orange dots. Note that null moves are not permitted. Again, working from the centre outwards, the Gold Guard's possible moves are indicated by dark-green dots, while the two legal moves for the Gold Elephant are shown by brown dots. The Gold Horse's moves are illustrated by violet dots, with the Gold Cannon's moves given as orange dots. Apart from the differences described above the rules of orthodox Chinese Chess apply.